Austrian pine is a medium to large-sized, evergreen, needle-leaved conifer; young specimens have a conical or pyramidal shape, but mature trees develop majestic, rounded, flattened, spreading, or domed crowns. Leaves are needles 3–6 inches long, stiff, dark green, paired in their papery fascicles, persisting for 4–5 years. Bark is furrowed, platelike, dark brown to black. Twigs are light brown, smooth but not waxy-coated, turning gray with age. Conifers do not "flower," but they do shed pollen; this species sheds pollen in March–April. Fruits are oval cones, not curving, to 3 inches long, stalkless, yellowish brown at maturity; the cone scales are somewhat shiny, with a tiny, usually curved spine at the tip. Similar species: Missouri has only one native pine species, the shortleaf pine (Pinus echinata). The other five pine species included in our flora (including Austrian pine) are non-natives that are commonly planted in timber plantations, for wildlife habitat, for erosion control, or as ornamentals: jack pine (P. banksiana), eastern white pine (P. strobus), loblolly pine (P. taeda), and scrub pine (P. virginiana). These species frequently produce cones and reproduce themselves within their populations, thus they can become naturalized locally and are counted as part of our state's flora. Other pines are grown only as ornamentals or on Christmas tree farms and do not reproduce on their own, so they are not considered part of our flora; these include ponderosa pine (P. ponderosa), red pine (P. resinosa), and Scotch pine (P. sylvestris). The bottom line is, unless you are at an old home site or at a place where the non-native pines have been cultivated and might persist on a local scale, the only type of pine you will encounter in the wild in Missouri is almost always the shortleaf pine. Austrian pine is a native of Eurasia but has been planted in America (as an ornamental or as a windbreak) for years. You are most likely to encounter it in lawns and other planted landscapes, though you might also find Austrian pines persisting at old abandoned home sites. If you are planting one, put it in deep, moist, well-drained soil in full sun. It can tolerate clay soil, urban conditions, and (once established) some drought. 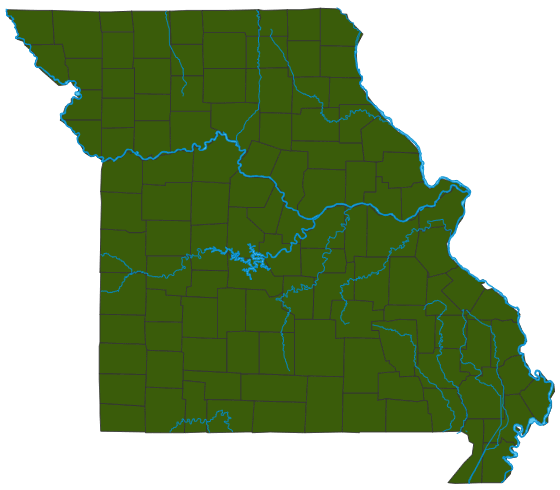 Used in landscaping statewide, but trees in one small population in St. Louis County were found reproducing; hence their official inclusion in the flora of our state. Also called European black pine. This tree rarely spreads beyond its plantings and has been popular for landscaping for many years. However, a serious needle disease called Diplodia tip blight has infected many specimens, causing dieback of branches and, at times, death of the trees. Large infected trees are almost impossible to cure with fungicides. Scotch pine (Pinus sylvestris) is also susceptible to this problem. Pines, both native and introduced species, are significant nationwide for landscaping, timber, windbreaks, erosion control — and for Christmas trees! Only one species, the shortleaf pine (Pinus echinata) is native to our state, but it, too, makes a huge economic contribution. Pines of all types provide habitat for birds and other wildlife, and a number of creatures, including squirrels and certain types of birds, eat the seeds. When ice storms come in winter, many birds can survive only by seeking shelter in the dense foliage of evergreen trees and bushes.